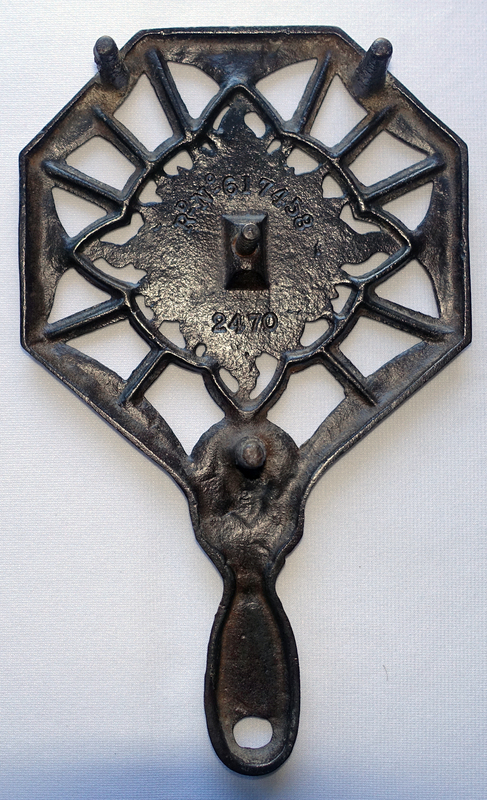 I’d like to share this interesting cast iron trivet from my collection. It measures 9 1/8″ x 5 1/2″ with three 1 1/4” legs, one center bracket for a firebar, and a smoothly filed gate mark along one side. On the reverse: the number 2470 (a foundry design number) and Rd 617458 for the year 1913. The Rd (Registered Design) number indicates this is a product of the British Isles. 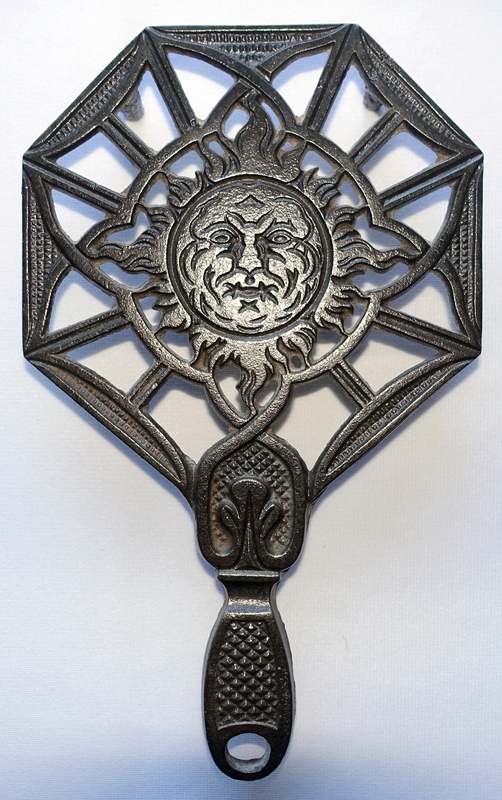 According to Hazel Mitchell, author of the book British Iron Stands (1991), “The seven sides of this stand represent the seven phases of the moon, the face in the center being that of the moon.” It seems only natural to refer to this trivet as the “Moon Phases” design. The Registered Design system was created as both copyright and patent. Once registered, an ornamental design was protected from being reproduced by another manufacturer. There have been two systems. The earliest, dating from 1842, was the British Rd Diamond system which I discussed in the previous blog post Ornate 1867 Victorian firebar trivet. Beginning with 1884, the Diamond mark system was eliminated and replaced by a system featuring an assigned sequence of numbers preceded by Rd or Rd No. (number). To learn more about British Rd Diamonds and Rd Numbers see Phoenixmasonry’s Dating English Registry Marks. A partial chart listing the first assigned registered number for each year from 1884 to 1931 appears below. (Design numbers were assigned until 1991.) My trivet is signed Rd 617458, which falls in the range for 1913. Hint: Keep in mind sometimes the small “d” in Rd can look like a 2, especially on a worn trivet. Use a magnifying glass, if necessary, to determine the correct registration number on a trivet or stand before proceeding to the chart. Discussion: a Moon Phases trivet with both an Rd Number and MADE IN ENGLAND on the reverse. Reverse of variant Moon Phases trivet. Photo courtesy of Richard Wojda, Alabama. Recently I was on Facebook reading posts at The Trivet Collectors Network when a photo captured my attention. It was another Moon Phases trivet from the UK ~ but TTCN member Richard Wojda’s trivet varied from mine in one very important detail. 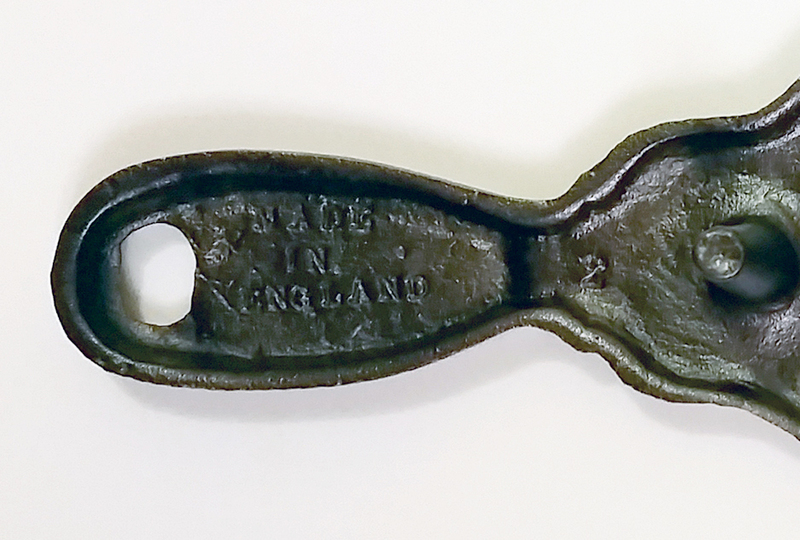 Besides the Rd number 617458 and the foundry design number 2470, Richard’s trivet was also signed “MADE IN ENGLAND” on the handle reverse. I’d never seen both markings on one trivet before; so this deserved further research. It’s important to understand that an Rd Number only documents when the design was originally registered. Production under the original Rd number could continue for years on a popular design. Now take a look at the underside of the handle. Adding the phrase MADE IN ENGLAND became mandatory in the UK after 1921 for items exported to the USA. On this trivet that phrase was cast into the trivet. You might find other trivets from the UK with MADE IN ENGLAND embossed on a foil sticker or similar removable label. Taking the following factors into consideration, I believe Richard’s trivet was produced between 1921 and 1939. ● During WW2 (Sep 1, 1939 – Sep 2, 1945) foundries switched to the production of arms and armaments. 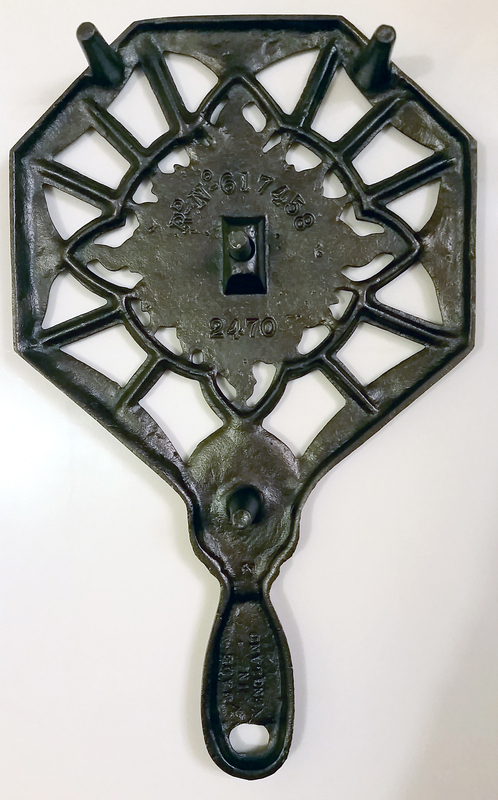 ● The center bracket (for attachment to stove or hearth) was no longer seen on mid-20th century trivets. 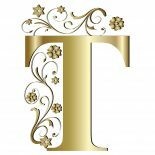 This entry was posted on October 31, 2017 by Lynn Rosack in Antique Trivets & Stands, Great Britain, Vintage Trivets & Stands and tagged British Rd Number, cast iron, Moon Phases trivet.